I was on vacation for a week, then it took a couple of days to get back up to speed. When I got around to mowing, I noticed that one of my peach trees was really bent over. It was just filled with tiny peaches. 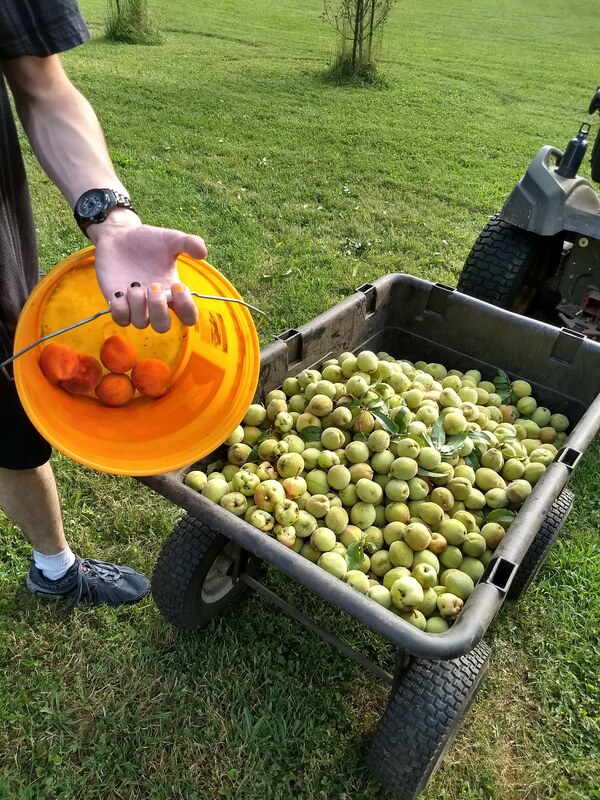 I took a cart full of peaches off of the tree and it's no longer bent over. However, I have a cart full of tiny green peaches. This time around I dumped them in the tree line, but is there any use for these? I lose most of my fruit to the birds, squirrels, etc. But we get enough for the family. I have a couple of peach trees that ripen at different times. The first tree didn't have so many little fruits. I have several fruits still left on it, but the bucket has the ripe peaches from the other tree. Here's a shot of how many thinned fruits there were. Here’s the best answer I found. You’ve got too many to do this with all of them, but if you try making peach pickles let me know how they taste! Toss peeled and very thin or julienned slices in a 1/2 and 1/2 mixture of unsweetened rice vinegar and plum wine plus scant sugar (to taste). Refrigerate these pickles until transparent and slightly macerated. Peach cold pickles are delicious on pulled pork sandwiches, vanilla or green tea ice cream, buttered toast, BBQ or roast chicken, grilled fish--or make homemade sushi rolls and put peach pickles and cream cheese in the middle. These are much earlier than this recipe suggests. The recipe implies that these are peaches that just aren't full sized. That's not what I have. These are slightly larger than the pit itself. There's no flesh on the pit. A hard green ball of something. Boil in sugar to candy. I'm not sure any of these ould help. I'm not familiar with peach growing. Also you might be able to chuck a whole peach on the top of a Rumtopf for added flavor. I don't know if that would work or not. If there is flavor maybe you could even make a peach vodka or peach whiskey (Southern Comfort). You'd still have to remove the pit, though. And that might be the breaking point for any of these ideas. Lots like they need to be thrown into the hog pen. We have a peach like that, no flesh on them. Just a green covered seed. The birds pick at them. firstly, these peaches seem to me too late to be dropped. usually we wait 45 days from end of bloom.